… and 43,000 miles since I purchased the Model S. And 5 years since I’ve been a Tesla customer. Many things have changed in 5 years, including aspects of the Model S itself. Among the long list of changes & features, two of them were the major reasons for the jump: AWD and autopilot hardware. Some of the smaller differences that helped: more range (90 kWh battery + higher efficiency), auto-folding mirrors, automatic high-beams, heated steering wheel, heated wiper landing zone, new seat design, and many more. Here’s some explanation for the options I chose. I’ll leave out the boring / aesthetic ones. When I first got my 2012 with the 85 kWh pack, I would get approximately 265 miles when fully charged. Since it’s not good to always charge to 100%, the car was generally left at 90% which gave me about 240 miles of range. That’s a lot. In a perfect world. When I made road trips deep in the New England winters, I’d rely on about 180 miles of range before I started needing to plan. Supercharging is most time-efficient from 0-80% so now you’re talking about 160 miles between charges unless you need the extra range — and I often do when road-tripping. That 160 miles or extra time spent at the superchargers can become inconvenient so, while I don’t often need it, I opted for the bigger battery. I now charge to 256 at 90% and 283 at 100%. In 2012 with an 85 kWh battery, you’d either get a 5.7-second car or a 4.2-second car if you opted for the performance. 5.7 is no slouch but I’m a g-force junkie and was coming off the Tesla Roadster (and previously the Subaru WRX STi) so I naturally opted for the 4.2-second car. Today, you can get down to 2.8 seconds on the Model S but the price (+$30k) and the hit on the range (-17 miles) wasn’t worth it to me. I drove the RWD Model S through 3 winters (using snow tires) and it did fine. Funny enough, the Tesla Roadster did better in this department (probably due to having 65% of the weight in the rear and I think the traction control in the Roadster is better under very slippery conditions). But, while it was fine, I live in New England and would prefer AWD. Secondarily, having AWD under dry, sandy, or wet conditions also makes a big difference — especially while pulling into traffic by taking a 90-degree turn. You can floor it while the steering wheel is significantly turned and it’ll nail it. Can’t say that about the previous Model S. I have yet to test it under winter conditions but given how quickly traction control reacts, I suspect it’ll be pretty awesome. The 21″ wheels on my previous Model S became warped due to hitting the pot holes we get here from the harsh weather. I ended my time on that car with 19’s. While that made a difference in 0-30 acceleration and some cornering, it just wasn’t worth it. Given the AWD on the new car, the acceleration issue doesn’t exist and the cornering — well, it corners very well. The tires are cheaper, the ride quality is better, and it’s not as noisy. I’m quite happy with this decision. I opted for the next-generation seats. They bolster your sides more and I desired this as I felt like I slid around in the seats too much during aggressive cornering. I was initially concerned they’d be uncomfortable when I sat in a demo car because you can feel it pressing into your back/sides but that concern was unwarranted. I don’t notice that feeling anymore. I do notice that I stick in my seat right where I’m supposed to! I decided not to add $2500+tax to my bill for premium audio. While I notice a difference, it’s not a big enough difference overall and it’s especially not worth $2500 to me. I’d rather have a Reus Audio system installed for that price (they’re well-known for Model S installations; I personally know the guy and have heard the results). A side-effect is that because there’s no sub-woofer, I gain a little trunk space (the right corner). In 2012, you could pre-configure your car with twin chargers (and the Signature edition I had came with it anyway). I installed the HPWC that’s required to take advantage of doubling your charging speed over the more common NEMA 14-50 solution that most people opt for. Today, this is not available as a factory option (hey Tesla — this is very annoying!) so I ordered it separately as an accessory that’ll be installed at the service center — whenever it arrives. I’m still waiting. There’s a distinct motor noise (reminiscent of the Tesla Roadster) due to the front motor. It’s not like any of the annoying noises (“droning” or “electrical cicada”) some of the older Model S’ (including my P85) developed. It’s a more “hey this sounds like the electric cars you hear in futuristic movies” sort of noise. And I kind of like it. I’d prefer complete silence but this noise isn’t irritating to me. I do not have the “balloon squeal” (a sound that pretty closely resembles slowly deflating a balloon through its neck) under any circumstances. At least not yet. The ride is far more solid. It’s hard to quantify — but the car is tighter and feels sturdier. It’s especially noticeable while driving. I’m getting better energy efficiency — according to the in-car energy app. In 70-degree weather I’m frequently under 300 Wh/m. I almost never saw that in the 2012 P85. Due to the front motor, the front trunk space is significantly smaller. That’s unfortunate but not a big deal. I still got all my charging gear, tire inflator, and winter sweaters & coats in there. The cover for the lower rear trunk area has been slightly re-designed — it’s stronger and sturdier. The front trunk (frunk) has a single latch (instead of two). I find it easier to close (you still can’t slam it shut of course but I find it easier to close without worrying about damaging it). The seat belts are a heck of a lot easier to pull out and latch. The charge port door (which is now motorized) works better. I sometimes had issues with the old design sticking closed (due to moisture or freezing) — I suspect that will no longer be an issue. The cup holders no longer have pincers to securely hold the cup in place. These were removed a long time ago allegedly because they ruptured a styrofoam cup with hot liquid in it. What’s there now is just a basic hole and while it doesn’t hold things as securely, it’s not presented a problem. The center console area comes standard with the yacht floor. I initially liked my old carpeted area but this is growing on me. It’ll be easier to keep clean, too. The glove compartment is a little smaller; there used to be a small cubby area that could be used to hold the J1772 adapter in place. I don’t really miss it. The alcantara material on the dash looks and feels nice. I think the jury’s still out on this for me. But that’s because I don’t really notice it much. The covers for the roof rack mounts are sturdier. There have been reports of the older style popping/breaking off too easily. The battery contactors sound quite different. They’re much quieter and sound much sturdier (which is a very scientific observation). The location of the brake pedal is better — you’re not as likely to brush the accelerator while pressing the brake pedal. The front defrost was redesigned as it wasn’t adequately spreading air across all areas of the windshield that need it. I’ll look forward to that change in the winter (which is when it most often presented a problem). The scroll wheels on the steering wheel are much more solid and easy to control. Previously I’d over- or under- shoot the item I was trying to scroll to. A small but annoying trait has been removed! Mercedes steering controls (which Tesla uses in their cars) swapped the directional and cruise control stalks from their former “backwards” layout to the more widely-adopted layout. That’s a good thing but it’s taking some getting used to. I still sometimes hit the directional instead of cruise. But everyone else who’s new to the car or is driving it as their secondary car will welcome that change. The new features are, of course, welcome. I’ve already enjoyed using the heated steering wheel and I love that the mirrors fold themselves in. The parking sensors are helpful. I’ll leave auto-pilot for another post but the hardware includes better mechanisms for hill hold (now “vehicle hold”) and transitioning from reverse movement to forward movement. My passengers have enjoyed the rear heated seats. I’ve used the automatic high beams without issue — though I’m so used to manual mode that I’m not really taking advantage of this. I haven’t come to trust it yet. This is significantly different than it was 3 years ago. Not only do I have a service center (two, in fact) and a sales center in Massachusetts (all within 30 minutes of me), everything was done online with very little work from me needed. 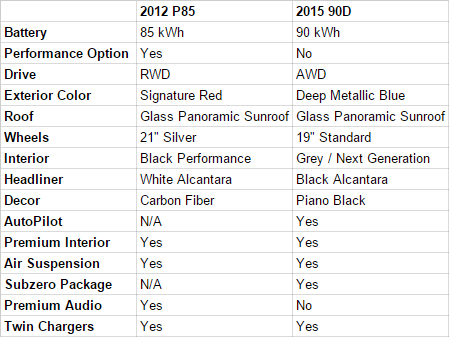 They sent a company to value my trade-in (the 2012 P85) while it was parked at my home. I paid the balance (new car – trade-in) via ACH online (I didn’t have to visit the bank for a cashier’s check). When I picked up the car, I signed a couple things and that was it. It was far easier and smoother than it ever was. Kudos to Tesla on streamlining this. Oh, and the new-car-smell is awesome (and bad for me)! I’ve owned the Tesla Model since since 10/11/12 (easy date to remember!) — so it’s been over a year now. I’ve been meaning to post something about having owned it for a year, but I decided to take an 850-mile trip to see my parents for Thanksgiving and write about that instead. It has nothing to do with procrastination. And gullible isn’t in the dictionary. 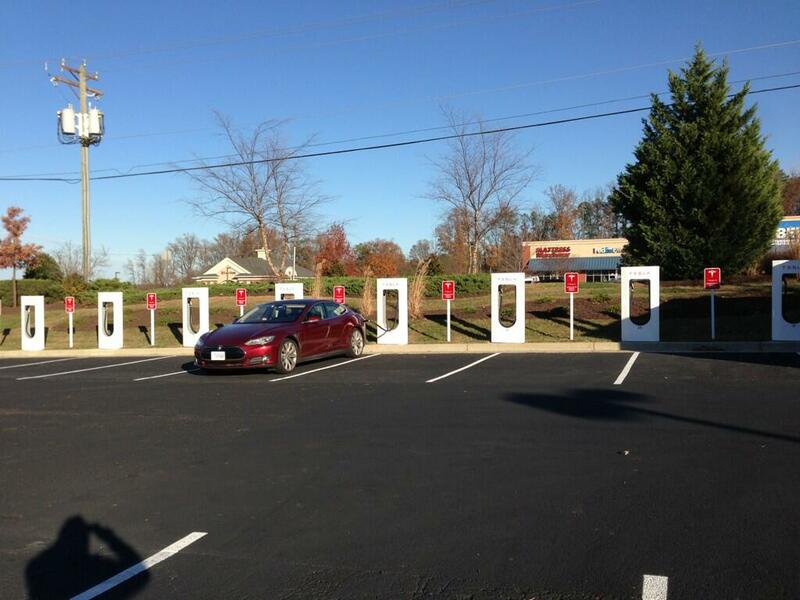 My route, essentially Boston, MA to Charlotte, NC, was directly in the path of Tesla’s Superchargers. I’d been waiting for the two I knew were coming – Virginia and North Carolina – as we already have Superchargers in Connecticut and Delaware. Once I saw VA and NC were up and running, I took the week off so I could drive down Saturday and return the following Saturday. All I have to do is pull up the list in the car and select which one I want to go to and the GPS will route me there. At 3:30 AM Saturday, I left the Boston area . 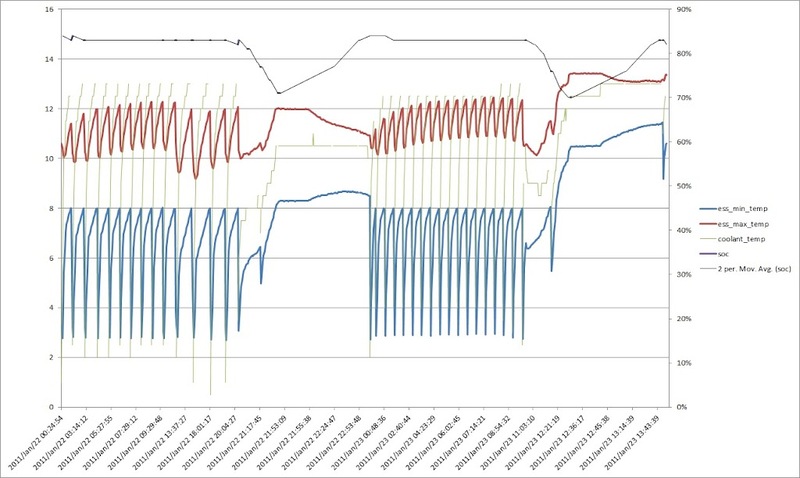 I pre-heated the car using the iPhone app (left). Pretty useful that I can set the temperature and then check to see if the temperature has been reached. The first leg to CT was only 140 miles and 46F — no problem for the Model S. I’d been to the CT Supercharger a few times at this point so it was rather uneventful. And way too early in the morning. Fortunately I spent the short time charging checking on traffic as I-95 was *closed* due to a major accident. Fortunately I rerouted and lost maybe 30 minutes of time. I arrived in Delaware – 183 miles away – and was charging by 9:40 AM. I had about 26 miles of range left. 16 minutes later I had 105 miles of range! I left Delaware at 10:50 — a little later than I’d hoped both because my next trip leg was 196 miles and I needed a fuller charge and due to “Tesla Time” — the time spent talking to the people who inevitably stop over and start asking questions (which is great!). Charging slows down as the battery gets full, so getting to 90% or higher takes quite a bit longer. While that’s being worked on, it’s important to remember you’ll need an hour to go from empty to near-full in a best-case scenario. While in Delaware, a motorcyclist approached me — pushing his motorcycle. He complained about how his day wasn’t going well at all so I inquired and offered to help. He said he’d ran out of gas a mile back on the highway and had just arrived, pushing his motorcycle the whole way! Range anxiety in an EV? Hah! I arrived in Virginia around 2pm and stopped in to Panera Bread for some lunch and coffee as well as make use of the wifi for some web surfing and whatnot. My next leg was 197 miles so similarly I needed to charge for about an hour. I also needed to restock my ice for the cooler. All still pretty uneventful — no traffic and no Model S’s to keep me company. I made it to Burlington, NC around 6:30pm . This time, my next leg was only 130 miles so I didn’t wait for a full charge; this was a relatively quick stop. I made it to my final destination around 9:15. Total trip time was about 18 hours. A trip in a gasoline car might have taken about 15 hours given the same traffic and conversations. Not bad — especially since the “fuel” is free! My trip only cost me toll money. The return trip was pretty much the same — including I-95 closing (in Delaware)! That was much worse traffic-wise (Saturday after Thanksgiving being one of the heaviest I-95 travel days) so my trip took 21 hours. And range wasn’t an issue despite the traffic. Why? EV’s are actually more efficient at lower speeds. The only other difference was that there were other Model S’s around and charging and I spent a lot of time talking to various owners — very cool! Some of them even “followed” me to the next stop and we talked some more there. So what stuck out to me about the trip? The I-95 road closures both times had me worried about my ability to reach the supercharger (was it on a closed portion of the road?) — there’s no “backups” at the present time, so be prepared. When more than half of the Superchargers are in use, you’re going to get a slower charge rate. So 1 hour could turn into 2. I’m sure this will change as time goes on — we’re still Early Adopters and in the early phases of the infrastructure buildout. There’s a sizeable difference in range when it’s below freezing (some of this is because I’m still running summer tires). Just because your destination is 200 miles away doesn’t mean you only need 200 miles of charge. Plan in a bigger buffer and keep an eye on your energy usage. Fortunately you can watch your projected range vs. what the GPS says you have left to go. Weather (cold, rain, slush in the road, wind) and elevation can affect your range. Right now, you still need to be mindful of these things. Assuming your energy usage is normal, if the car says you have 5 miles of range left, you really do have 5 miles. Tesla answers the phone at all hours of the day. I called them several times to inform them about some Supercharging inefficiencies and I not only got a live person, but they were able to “log in” to my car and the superchargers and check various statistics. The car is comfortable for me to ride in. The last time I did a road trip of this magnitude was 20 years ago when I was still a teenager. I’m amazed how comfortable I was and that it wasn’t bordering on impossible to do, especially in an EV. Cat-napping in the back seat with your coat as a pillow actually works. 🙂 You can turn the heat and music on and let the highway drone put you to sleep. 20-25 miles remaining at arrival “feels” good, though I’ve arrived with less than 10 on several occasions. And while I’ve not worried whether I’d make it, I do pay attention if my projected range and distance to go is that close and start adjusting appropriately. Fortunately it’s easy — just slow down. It’s more efficient to go slower. In fact you can go over 400 miles on a charge if you drive slowly enough. If you’ve been responsible for deploying and maintaining software your colleagues develop, you’ll understand phrases like “throwing it over the wall” or “they don’t get it.” I used to utter those phrases in frustration all the time. I don’t anymore, because I know who’s fault it was — it was mine. I took a position as an application operations admin over 7 years ago. The company was still in the start-up phase — and that meant areas like automation and operability were suffocating. There was no way to build a fresh QA or Dev instance of the product from scratch. There was no way for QA to push a button and get the latest code compiled and deployed. Managing production was rocket science and we were always paging the developers whenever the slightest thing went wrong. I changed that — which sounds great, but was actually a Trojan horse of sorts. I was thanked profusely for taking the bull by the horns and automating things and diving into the code to understand what the logs were saying so I didn’t have to page developers. The architect’s wife thanked me for how much sleep he was now getting (true story). Great, right? Wrong. Fast forward a few years — we’ve continued to ignore the back end and no one knows how to install the platform anywhere, even on their developer workstations. I wrote the documentation for how to build and deploy the software. I ended up writing the automated installer for it. I was the release engineer, the build master, the operations guy – the only guy who knew the product end-to-end. We suffered a massive outage (why is this the only way we learn?) — I really wanted to scream “I told you so!” … but I didn’t. I couldn’t. I realized I’d failed my job. I’d failed to get the business to understand the risks and poor decisions that were being made. It was at this point that I started to realize that what I’d done was turn Operations into a giant black box. I would consume the source code, perform some black magic, and get it out to production. Me, the hero for figuring it all out and letting the developers just code. Turns out, I was the villain. We’ve started to undo some of the damage I’d done, but it’s a long uphill battle. About 2 years ago, we’d come to believe it was finally time to have someone responsible for release engineering, build automation, deployment automation, etc. I was contemplating my next career move at the time, and this looked like a good opportunity to manage a brand new team. So that’s what I did. When forming this team, there was a lot of buzz around “DevOps” so I did a lot of research. Sadly, it looks like a lot of people are making the same Black Box mistake with respect to DevOps. One way to get the code from source control to production is to introduce a team that’s responsible for bridging the gap between Ops and Dev. And this is incorrectly labeled as a DevOps team. Check out the Wikipedia entry for DevOps if you’re scratching your head. DevOps is not a team, it’s a mentality — a way of working together. If you create a DevOps team to bridge the gap, all you have done is move the black box. You’ve increased the size of your organization and added another hand-off point. You’ve decreased efficiency and increased the chance for error. I was getting a lot of pressure to name this new team of ours DevOps, but I refused based on this realization. Instead we named it the PD Tools team (I now wish we’d named it the Engineering Services team). Our mission is to enable our engineers to focus on delighting our customers because we provide them best-in-class tools, systems, and processes. It’s always in the back of my head that we’re here to enable our developers to create a buildable, testable, deployable, and operable product for Operations. It is not to do that job for them. If we did that job for them, we’d be that villainous Black Box. The PD Tools team is a little over a year old now and recent events have me thinking about it’s charter. I’d like our responsibilities to shrink even more by pushing more of them to the developers. We shouldn’t be in charge of the tools they use — that’s creating another black box! So if we shirk that responsibility, what does that leave us? We’d supply the systems or services needed to run those tools, and we’d act as subject-matter experts to guide and educate. We’d be aware of the large central organization (we’re a 150-person business unit inside an 8,000-person company) offerings and make sure our local team was aware of them. Ultimately, the end-to-end processes to define, build, test, deploy, and operate a product are owned by the entire organization as a whole. The lines of responsibility should blur and merge. This requires a different mindset and process (which Agile, Scrum, and DevOps methodologies solve for). It’s making sure everyone understands each other’s challenges and works as a team together to solve for the end-to-end process. Drawing lines and passing the buck around is just connecting Black Boxes together and hoping it’ll work out. On February 8th, a New York Times reporter published an article about a trip he was invited to take to document the usefulness of the Tesla Supercharging network. 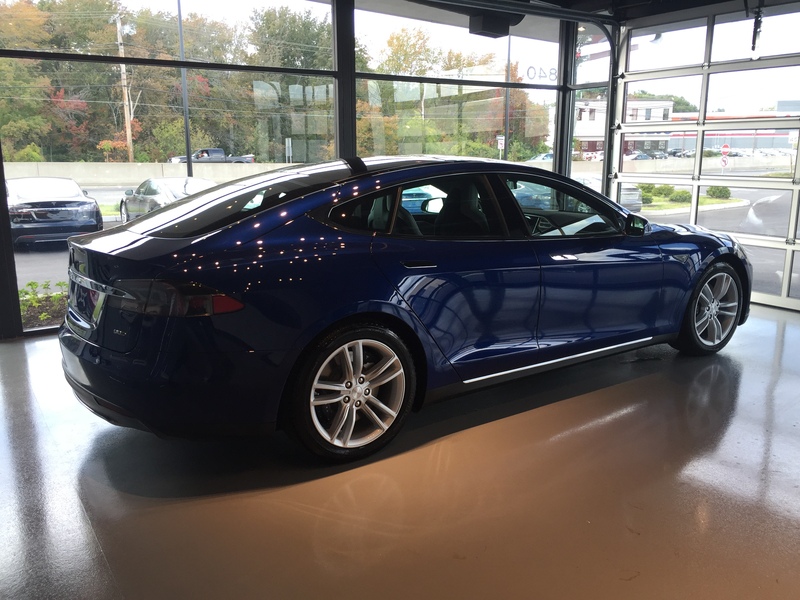 According to the article, the Model S ran out of power and had to be towed to the Supercharge in Milford, CT. This sparked quite a bit of controversy. There are over 1,000 posts on this thread at TeslaMotorsClub forums that I participate in. Elon (CEO at Tesla) Tweeted that it was fake — that there are logs that contradict many of the statements Broder makes and that he didn’t follow the instructions given to him. As things heated up, a number of us on the east coast of the US (within easy reach of Broder’s route) started talking about recreating the trip together and proving it can be done, and easily. We did exactly that on Saturday and Sunday (Feb 16-17) — including staying overnight at a hotel in Groton, CT like Broder did. The trip came together at the last minute and the rally behind us was amazing. The trip started off at Tesla’s service center in Rockville, MD. 30-some people showed up to send off 6 Model S cars. Some people joined in on the spot. 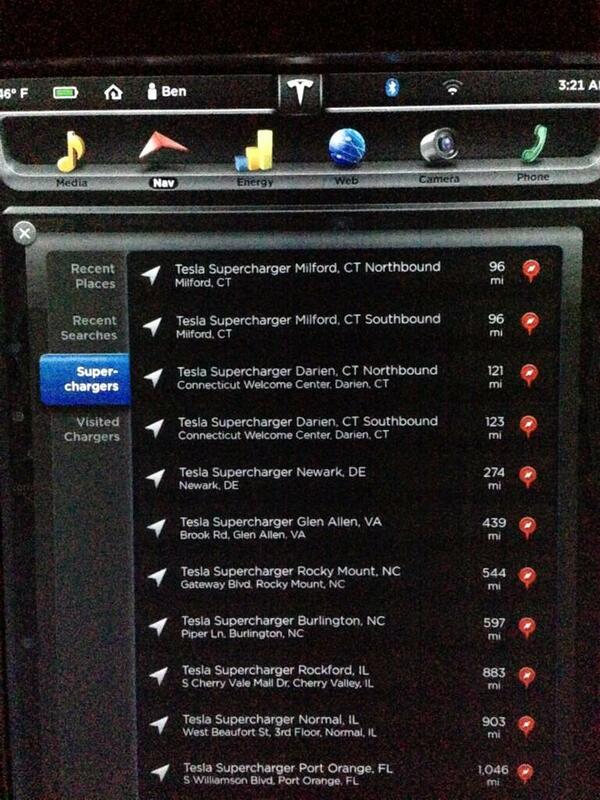 The first stop would be 108 miles away at the Delaware Supercharger. Late (as in, nearly midnight) Friday night, I decided I needed to participate despite the fact that I’m about 450 miles from Rockville. Given I’d be driving through the night, I didn’t have enough time to get all the way to Rockville and get at least some sleep in before the trip back started — so I made my way to the Delaware Supercharger, via the Milford, CT Supercharger. The trip down was uneventful. 146 miles from home to Milford, CT followed by about an hour of charging and napping, followed by 198 miles to Delaware, and then another few hours of napping (while charging). I arrived in Delaware at 7:30. The rest of the team started showing up around 10:30-11. We had up to 9 cars during part of the trip (some didn’t have time to do the whole trip) so we spent some time at the rest stop eating, chatting, and showing off the cars to the multitudes of people interested in the cars. We even picked up a groupie who followed us in their car (not a Model S) for about 70 miles. George Blankenship, VP of Sales & Ownership Experience at Tesla, even FaceTime’d with us before we got underway. The trip started with something pretty amazing. One the cars that joined us last minute was having trouble Supercharging in Delaware. He wouldn’t be able to make it to Milford with us (but he’d have no problem using slower charging or just returning home). So what did Tesla do? They remotely diagnosed the situation (logging into his car and into the Superchargers), found that he had faulty hardware in his car, and pushed a custom software update to bypass the faulty hardware so he could charge and be on his way. That’s not just world-class support — that’s unheard of. Unprecedented. Just awesome. We documented (both automated messages “from” the cars and the rest of us manually posting) via our Twitter account, YouTube, the TMC Forums and blog, and LiveStream. The trip, in short, was uneventful. We all made it to Milford, CT (where some people left the caravan to honor their previous commitments) without issue. In fact, all but one of us had virtually identical range left in the car (the one who didn’t is consistently using more energy than the rest of us, which Tesla will investigate; despite that, he still made every leg of the trip). We all got charged up while eating dinner (and interviewing with a local reporter) and continued on our way to Groton, CT. where we turned in for the night (like Broder did). Some of us plugged into standard 120v outlets, and some didn’t (so we could learn about the effects of being plugged in overnight vs. not — because Broder didn’t and lost some range to the cold temperatures). Everyone had more than enough range to make it back to Milford the next morning. I continued back home to Boston — another uneventful trip despite the cold weather, high winds, heavy snow, and very poor highway conditions (often 30 MPH or less). Everyone else made it home without incident as well (some drove all the way back through Delaware to get home to the DC area). There’s a lot more detail I’m leaving out simply because I don’t have the time to write it all down. I do want to thank everyone who participated (what a great group of people!) – I’m so glad I chose to participate. And I want to thank Tesla for their on-the-spot support, for building such an awesome and inspiring car, and all the hard work to build the Supercharging network to enable road trips like these. Gas Prices? Supercharging is FREE. Forever. I received my Model S Friday, October 12th. I’ve put about 700 miles on it (400 miles the first weekend), given lots of rides, and taken copious amounts of video. I’m ready to comment on the car itself. I rode in the Model S twice last year, several more times a few months ago, and I’ve test-driven it. Now, having owned a Roadster and being fanatical about keeping up with what there is to know about the Model S, I mostly knew what to expect. And the rides and test drives were no doubt really good. However, none of that prepared me for driving my own in my own familiar territory. Since I traded in the Roadster for the Model S and since Tesla can’t sell directly in Massachusetts yet, I was driving a rental Nissan Versa for 9 days in between (to make a long story short). In the back of my mind, in a very non-serious way, I was beginning to tell myself that I could get used to driving a car like the Versa … no bells and whistles, no pickup, putting gas in it, having a transmission, etc. etc. I had somehow managed to start forgetting how much I disliked driving a combustion-engine vehicle. The car is indescribably smooth. And it’s impossible to capture why that’s so important. I’ve told countless people about how awesome the instant and smooth continuous torque that the Roadster has is — yet they never get it until they’ve ridden in one. Let alone drive one. This takes that aspect of the Roadster and magnifies it ten-fold or more. It’s truly surreal. You might as well have stepped into a time machine before getting into the car. I’m not kidding, and I’m not exaggerating. So lets transport our thinking past the delivery and into the week of driving (yes, that first bit was just a tenth of a mile). I’m driving a fully-functional, full-size, gorgeous, fast, refined futuristic car — a car that really goes 265 miles (at 65 MPH) on a full electric charge. That electricity (at my home) costs me about an eighth of the cost of gasoline. That charge is free when I do it at one of Tesla’s Supercharging stations. Let me say that again. When they’re fully deployed, I can take a 6,000-mile road trip to California and back for free. No gasoline. Nothing. Zip. Oh, and it’s solar-powered. Yeah. I have the performance edition of the car — which means I go from 0-60 in 4.4 seconds. It means I stay with (or beat) an M5 doing 0-100 MPH. It means your face melts into the back of your head when I floor it. It means that some of my passengers scream and grab on to me and beg me to stop when I floor it. It does all this effortlessly (I don’t have to be a Nascar driver and shift like a pro to get these numbers … or use “launch control” or risk breaking my transmission) and silently. You’re thrown back into your seat, and you stay there until I let up. There’s no intermissions during that run to 100 MPH. No shifting. Nothing. I can also drive the car like a normal human being — e.g. when I have eggs from the grocery store in the car somewhere. And it’s pure grace. I still can’t get over it. And that’s after having owned a Roadster for 2 years. The Model S takes that and refines it so much that you need an electron microscope to find any imperfection. And I have one (figuratively speaking of course). So if you’re starting to gag from the gushing on this side — know that I will be covering the issues with the car down below. The car has 21″ wheels (optional). They’re … huge. But they don’t affect ride quality at all; this is probably in part thanks to the air suspension. The car sticks to the ground like it’s on rails. It puts down 416 HP (443 lb-ft of torque) and gets it all to the pavement. It brakes exceptionally well. The traction control is amazingly fast and accurate. Much faster to respond than the Roadster. So the car is a dream to drive. OK. You’ve heard enough of that. Did I mention there’s a seventeen-inch touch screen for controlling virtually all aspects of the car? That’s in addition to the beautiful LCD screen behind the steering wheel. You aren’t lying if you said that this is a computer on wheels. It literally is. The touch screen lets you have an enormous Google Maps display. It lets you browse the Internet. What, what? Yes, the car has built-in cellular data. So that means you can also stream Slacker radio right in the car. It also means Tesla can give you software updates remotely. It means they can remotely diagnose your car. Chew on that for a while. Chew on what software updates means on a car that’s controlled by a touch screen. A system without physical buttons. They can (and already have — several times since they started shipping) make your car better over time. They can add features to your car. For free. This thing is so extensive that the instructional video I made of it is 55 minutes long (and I skipped a couple features)! But don’t let that scare you. It’s pretty intuitive. And my trepidations over not having physical buttons were unfounded. I’m quickly getting used to it. And I know Tesla has the ability to refine it further as time goes on. They already have a proven track record for doing this. Using media in the car (FM/AM/XM/Streaming/Bluetooth) works out relatively well. I’ve had a few bugs in this area (choppy bluetooth streaming, not connecting to my phone, FM not working at all) — and sometimes I have to reboot the system to clear it out (note that you can reboot that system while driving. It’s completely independent). It also sounds pretty good to my ears. Best stock system I’ve personally had. The browser is more like a gimmick right now. It doesn’t work particularly well, but it’s fun to pull up cnn.com on it. I assume this will be improved — but there are more important things to improve first. The backup camera (HD quality, comes with the tech package I believe) is ridiculous. Very high resolution and works quite well in the dark. Very nice. Google maps is fantastic to have in the car in that large format. Unfortunately it’s slow to download the image tiles so if you’re using it to browse the area, it can be a little painful. It keeps up with driving (if you have it following you) just fine. I blame the 3G speed and poor reception. I hope 4G (real 4G — as in LTE) comes soon. The turn-by-turn Navigon GPS (which interfaces with Google maps in the car) works very well. The only nit I have about it is that the volume for it is independently adjustable — which makes it difficult to keep up with changes in volume from the media you’re playing, or from road/wind noise (especially if you roll the windows down). But hey, that’s just a software update away from being fixed. Controlling the car (opening/closing the sunroof, turning lights on/off, etc.) is also straight forward. And I don’t often visit those screens except for the sunroof. And that’s my last nit for now on the 17″ screen. It needs to be easier to get to the sunroof control, especially if you’ve selected something else in the controls screen before (software update can … oh, you get the idea). The interior is Spartan. It’s sparked quite a bit of debate. “Not enough cupholders!” “Where do I put my cellphone? My change? My sunglasses?” etc … So this is a personal taste thing for sure. And I wasn’t sure how I’d feel about it. I like it. A lot. It reduces the sense of clutter or being cramped. It opens the car up. I feel … cleaner. And that’s even without the cubby area under the 17″ screen that I’m waiting to have installed (because it wasn’t ready for production when my car was built). The two cupholders in the car (yup, only two) function relatively well. But they’re awkwardly placed. Given that I’m not trucking a family around or taking road trips with 4 other people in the car, it doesn’t bother me. But I can definitely see it it would bother others. Tesla’s working on a solution, but it’s not clear what that the choices will be. The visibility from inside the car is limited — though coming from a Roadster, it’s fantastic to me. It’s all about perspective. The one thing I will say is that the top-to-bottom rear field of vision is ridiculously narrow. I have to drop my head down (and I’m short!) when looking in the rear-view mirror in order to see more than 3 cars behind me. The cabin lighting is reasonable. It’s all LED-based and I personally like the way it looks. It might be too dark for some — e.g. if you’re trying to read. I’ve not tried that yet. The lighting in the rear trunk is completely useless, however. It’s impossible to see anything in the dark. The front trunk may also be equally poorly-lit — I haven’t checked yet. The key fob is a fantastic touch to the car — it’s a scaled-down version of the car itself with no physically-apparent buttons. Great out-of-the-box thinking there. I love that I just leave it in my pocket when getting in and out of the car. When approaching the car, I just gently press the door handle which causes it to extend and then I can get in. Getting it to unlatch is little weird at first (though less so for me — the Roadster had a similar unlatching mechanism). The car is now alive and in accessory mode. The HVAC is already on (if you left it on) and your music is playing and the interior lights are on. Simply sit in the car and press the brake pedal and the car is now fully on — it’s literally ready to go. No ignition. No keys. No button-pressing. Getting out of the car is similarly frictionless — just put the car in park and exit the car. It shuts down and locks as you walk away. I’m still getting used to that. But boy did I start appreciating it when I was running errands the other day and constantly getting in and out of the car. Pretty cool stuff. The door handles. OK, they’re neat. They get lots of attention and “wow’s” and draw people in. And for that reason, I’m happy they’re there. But they need some work. The handle will go on to a retract timer (5 seconds) when you shut the door. And if you don’t immediately catch it (e.g. you just realized you need to open the door again), you have no chance. You grasp the handle and tug but nothing happens. You let up the pressure a little bit and you see that the car is trying to pull the handle in. You freak out and rip you hand away and the handle snaps back into the car (there’s no danger of losing fingers here). Then you have to compose yourself and try the normal door-opening dance again. And sometimes the tug won’t open the door and you’re left wondering how to get into the car. Unlocking the car manually with the key fob seems to cure that condition. And they collect fingerprints. LOTS of fingerprints. Best have a clean rag around at all times to shine them up. So what’s wrong with the car? There are several items on the list for service to look at (may turn into a software bug / fix). Here are a few: day/night mode is over-sensitive, wiper (while set to auto) tends to wipe once when turning the car on, soft “whine” during acceleration that’s supposedly supposed to have been fixed from the beta cars, light buzzing (from the audio system?) when touch screen is dimmed (not audible while driving), and a few others — all pretty minor stuff. As far as software issues — a few of those, too. Some are a little more annoying but nothing debilitating. For example, bluetooth streaming isn’t always stable (can cut out, and I’ve had it disconnect from my phone while streaming several times now), FM/AM radio audio stopped working, the driver door *opened* when unlocking the car, and losing data connectivity even though I showed 3-4+ bars of signal. Most of these are cured with a reboot. The good news is, I’m emailing the Tesla ownership team about them as I find them and I hear back usually within a business day. That’s it for now. I’ll try to keep posting my “review” of the car as I get more time with it. In the meantime, don’t hesitate to ask questions — I’ll try to respond to all of them. I’ve had the Tesla Roadster for over 4 months now. It’s got about 3100 miles (5000km) on it. I’ve been able to drive it with the top off on 50-70F (10-20C) weather, in ice cold -5F (-20C) mornings, rain, snow (with winter tires), and near-ice conditions. It’s had a number of minor issues which resulted in servicing it both in my driveway as well as in the NY service center. Overall, I’m enjoying the car. I’ve had it long enough that I’m (mostly) over the giddy excitement and can start taking a balanced look at it. Any negative comments I make are meant to shed light on what could be improved, and not to argue against BEV’s (Battery-Electric Vehicles). I believe in their future, but it’s a huge uphill battle. I’m also keenly aware that this is a sports car and isn’t exactly designed for the New England weather I’m putting it through (especially without a garage) — but I’m commenting on it anyway as there’s still stuff to learn from it. I enjoy acceleration (much more than top speed). I’m no stranger to it — my other car is a modified STi which will go 0-60 MPH in less than 5 seconds stock — if you’re good at shifting and launching. With its current modification, it has incredible power even in third and fourth gear on the highway. I usually don’t feel the need to downshift from 6th to make an aggressive passing maneuver on the highway. It has a top speed of 160 MPH. The Roadster’s 0-60 is definitely fast. What’s most incredible about it for me is that it’s an effortless and smooth experience. No shifting, no jarring movements. Just floor it and grin … or black out. Full torque is available at essentially 0 MPH and without winding up the engine or pre-loading the turbo. It’s available immediately on command. I’ve had a couple people in the passenger’s seat complain about being unable to handle the acceleration (nausea, feeling like they’re going to pass out, etc.) Clearly, they don’t like amusement parks, either! Even more impressive is flooring it when you’re cruising at, say, 30 MPH. I describe the experience as being rear-ended by a Mack truck because it’s so instant and so powerful. There is no comparison to any normal “ICE” (Internal Combusion Engine) vehicle. Acceleration above 60 MPH, and especially above 75, is not impressive to me. I’m probably spoiled by the STi in this area. Fortunately it doesn’t bother me because it’s more than adequate and my commute doesn’t involve the highway. There’s a section of road that I’d have fun flooring the STi and getting up to 90 MPH before slamming on the brakes to make the corner. I’m lucky to get the Roadster up to 80 MPH on that same run. Realistically, I’m very happy to see that this electric car has a top speed of 120 MPH (versus others that top out at 70 or 80 MPH). It’s one less reason to think BEV’s are a joke. The regenerative braking in the Roadster is atypical and important to understand to see its incredible value. By merely letting up on the accelerator pedal, the Roadster will behave as if you’re hitting the brakes. This process of slowing down the car recharges the batteries. What’s important to realize here is that you can generally drive in traffic without moving your foot to/from the brake pedal — you just adjust your position on the accelerator pedal. I find this to be a significant advantage and particularly attractive feature of the Roadster. What may not be obvious, especially in light of the way regenerative braking works in the Roadster, is that the throttle mapping — the design of how the car accelerates/decelerates based on how far you’re pressing the accelerator down — is extraordinarily well-designed. Tesla engineers really nailed this (and I imagine it was a long and difficult process). I don’t think I could be happier with it. The actual brakes are weaker than I expected. I have tried mashing the brakes as hard as possible at 60 MPH. I need to apply far more force and slow down less quickly than I expected. My STi does much better here. The weight distribution of the car is about 65% rear, 35% front. This significantly uneven distribution of weight makes it difficult to design a car for balanced traction while cornering. The Roadster suffers from significant understeer — which means the front tires lose traction before the rear tires. While this is safer than oversteer (rear tires give way, which leads to losing control of the car), the car doesn’t corner as “quickly” as I’d hoped. It’s certainly better than average, but it’s not as good as it should be. I’ve seen other Roadster owners (who own the Sport edition, which comes with adjustable suspension) say that a lot of this can be cured by adjusting the suspension and sway bars. I kind of wish I’d ordered mine with the adjustable suspension. Many people ask me if I can spin the tires by flooring it. It won’t on dry pavement (even with traction control off). I don’t have the Sport edition (which might have enough low-end torque to do it), but I also don’t have the ultra-sticky sport tires, either. I actually think it’s good design that it’s just on the cusp of being able to spin the tires — it means the tires are just right for the application (and not too big, which would just mean excess weight, rotational mass, and frictional loss on the road leading to poorer range). The traction control on the Roadster is nothing like what you’ve ever had before. It’s incredibly sensitive and accurate. I’ve driven it uphill in 3 inches of soft snow, packed wet (nearly ice) snow, and slushy snow — about the worst traction conditions you can have. The TC system kicked in without me noticing — except that no matter how much I modulated the accelerator pedal, the forward acceleration remained constant. I was unable to detect any adjustments the TC system was making to keep the wheels from slipping. It was an incredible experience. There were no signs of your typical ICE-based TC behavior (increase torque, slip, decrease torque, increase torque, slip, repeat). Even on dry pavement with the winter tires (which sometimes can’t handle the full torque output depending on the terrain), the TC does a perfect job at maintaining the tires at their maximum output without losing traction. Check out the videos at the end for some insight into what it’s like. The seating in the 2010/2.5 Roadster is different than previous models. For example, there’s no adjustable lumbar support. I find these seats plenty comfortable. They strike such a good balance of comfort and support that I’ve never made a mental note about them while driving. Your legs stretch out nearly horizontally which was a little weird at first but I quickly got used to it. I find my legs rubbing against center console which can be uncomfortable depending on what I’m wearing. Some of my jeans have a seam that’s in the same spot and I have to adjust my leg as I’m driving or try to adjust the pants such that the seam lands in a different area. There’s not a lot of side-to-side leg room but I find there’s enough even while I’m wearing boots. Overall, once I’m in the car, I’m pretty comfortable. For me, the steering wheel, leg position, seat position, etc. work well. This changes when I have a passenger in the car, especially if that passenger isn’t a super-thin individual or they’re wearing a thick winter coat. My right arm has trouble finding room to operate the car (steering). It’s definitely tight quarters in there with two people. I had long become used to the stiff ride of my STi. The Roadster (non-sport) is actually a softer ride in most respects. Anything that causes large sudden movement in the suspension is louder than the STi, but the Roadster handles it well. Speed bumps are softer in the Roadster — especially in the rear due to all the weight on the rear axle. My daily commute involves 5 large speed bumps (2 rated at 15 MPH, 3 at 20 MPH). I go 5-10 MPH faster over them without trouble. The rear is probably a little too soft for a sports car, but I find it’s a good balance for the driving that I do. Railroad tracks are handled better than my STi. The ones I drive over regularly aren’t the bumpiest, but it’s a good testament to the way the Roadster generally handles road imperfections. I’m pretty happy with it. The Roadster has no power steering. I wasn’t worried about that since one of my first cars lacked power steering. I even remember missing it when I got my next car which did have it — you don’t feel the road or tires so it’s harder to gauge what’s going on and it’s not as fun to drive. You learn to steer after the car is moving and you learn to enjoy feeling the road. Even the steering wheel is significantly smaller — and that’s a good thing considering how little room there is inside the car. I actually like the size, and find that when I go back to the STi, the steering wheel feels HUGE. Controlling the speed of the car is effortless. You can take a gentle ride, commute, or go for a spirited drive — all for the same low effort. There’s no manual shifting, and there’s no automatic shifting. There’s no concern for predicting how long it will be between when you move your foot on the accelerator to when you’ll have power. There’s no flooring it in advance to make a passing maneuver. It goes as fast or as slow as you want it, the moment you want it. That’s it. There are some quirks, however. The system mimics the way an automatic wants to accelerate at low speeds when you let off the brakes, but it’s not exactly the same. At a complete stop, the motor is not trying to push the car against the will of the brakes. Instead, when you lift off the brakes, the motor engages a few moments later — which means you can roll backwards a bit. It also means that if you don’t sufficiently lift off the brakes, you’ll simply roll backwards until you do. The other problem with the design is that as you’re slowing down and approach zero, the forward push that the motor is providing suddenly stops, which makes for a less-than-smooth stopping experience. Regenerative braking is generally a joy to work with. As I’d mentioned before, it’s an integral part of the experience, and means that you don’t have to swap back and forth between the brakes and accelerator in traffic. There’s one unfortunate quirk in this system in temporarily low-traction situations. 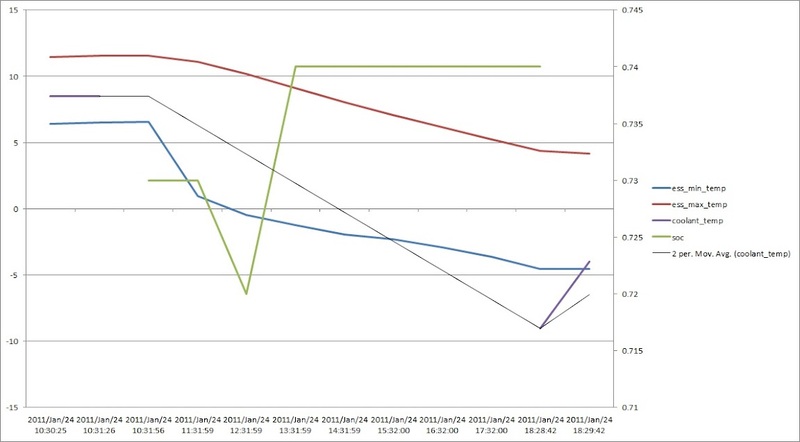 A number of times, I’ve been slowing down and hit a low-traction situation (going over a large bump, spot of ice, etc.) and the regenerative braking doesn’t just back off, it completely shuts down — which means I’m lurching forward faster than I’d intended, and without my foot on the brake to correct the situation (since regenerative braking is performed on the less-effective rear wheels, there’s still plenty of brake power left in the front wheels, but only with the brake pedal). While rare, it’s a particularly unsafe situation — but I’m not sure what could be done about it without regenerative braking independently on all 4 wheels. Crawling forward in the car is nearly silent — you hear the tires on the road and any noises from the tires meeting debris. Anything above 5 MPH results in enough tire noise that you can tell there’s a car moving. The difference is, there’s no engine noise. Flooring it results in a little bit of in-cabin electric motor noise. It’s really amazing to be able to really gun it without creating a lot of noise. From outside the car, you pretty much only hear tire noise. Normal cruising is simply about the tire and wind noise. The wind noise in the Roadster is significantly higher than in most cars — primarily due to the design of the removable top, windows, and seals. It took a little bit of getting used to, and I look forward to the day of an EV where you can barely hear the wind or tire noise. I haven’t had the opportunity to drive with the hard top on to see what effect that has on noise levels, especially in the rain. When it’s raining, you can definitely hear it on the soft top, especially while driving. I’ll take this over engine noise any day. There are rattles (detectable at low speeds) which seem abnormal (and I’ve had Tesla investigate, without success). Rattles drive me crazy and I’m doing my best to ignore them. Whether they’re normal in the Roadster or not, I don’t know — but if they’re normal in the upcoming Model S, I’ll not only be disappointed, but very worried about the complaints Tesla will receive. One last minor nit-pick is with the sound (and feel) of the play in the transmission (the single-speed reduction gearbox). When the torque output switches directions (e.g. while driving in traffic — forward acceleration followed by regenerative deceleration), the play in the transmission can be felt and heard at low speeds. It would be great to clean up this experience. You might think that the electric heat on the Roadster is quick and powerful — but it’s not. In near-freezing temperatures, it’s fast enough — warm air in 30 seconds. When it’s well below freezing, it becomes inadequate. I turn the heat on to the floor for several minutes before pointing it into the cabin because it takes a while for it to heat itself and the air ducts up. Even then, the air is luke-warm. If the car sits perfectly still, it’s enough to get the cabin comfortably warm. But due to all the air leaks (read: wind noise), it’s insufficient while driving. Even worse, the design of the floor heat is such that the passenger foot-well gets warm, but the driver’s-side stays cold. Running the heat consumes approximately 3,000 watts — which would probably be enough with added insulation and fixing the air leaks. There are heated seats, which are plenty powerful. They’re great for keeping warm while driving around with the top off in cool weather. They also consume VERY little power. Since I received the car in October, I haven’t had the need to use the air conditioning for anything significant. The compressor is variable-speed so I haven’t heard what it’s like at full-throttle. However, when I received the Roadster, it was very loud even at the lowest speeds. Turns out it was defective and has since been replaced. Now, when I used it (e.g. to defog the windshield), all I can hear is the ‘click’ when it turns on — I can’t hear it operating anymore. The effect that heat and A/C have on range vary on, of course, the temperature, but also the speed at while you’re traveling. The short version is that my range has been affected about 10-20% when it’s really cold outside — some of which is due to the loss of regenerative braking when the car has been sitting in the cold without being plugged in (which keeps the batteries warm enough for charging). There’s more detail on this below. Getting in and out of the car is far from easy. It’s very low to the ground, the seats are even lower, and the door sill is really wide. It’s amusing to watch my friends get in and out of the car. I’ve figured out the tricks needed, but it’s never easy — especially if I have a coffee or things in the passenger seat to take with me. It’s a lot easier with the top off. The difficulty is one of the reasons a sports car isn’t “me” and I’ll probably move on to a Model S (4-door sedan) when I can. Charging the Roadster is easy. There are a number of options, mostly based on using standard receptacles. In the U.S., this ranges from typical household 3-prong 120V connectors, to 4-prong 240V “stove” or “dryer” connectors, to a 240V welding plug that you might find at a mechanic’s shop. I personally usually plug into a 50-amp 240V receptacle (running at 40 amps) which is good for recharging from empty in 6 hours. Since I plug in every night when I get home, the car is always full in the morning. There is a high-power “home charging” option which requires a 90-amp circuit (supplying 70 amps) which can fully charge the car in 3.5 hours. You can set the car to start charging on plug-in, or at a particular time (to take advantage of off-peak rates). A more useful feature would be to tell it when you want it to be done charging so you don’t have to predict when to have it start charging. Additionally, you can tell it to consume less than the maximum power if you know the circuit can’t handle it. I pretty much always keep it set to charge on plug-in. Given that I don’t have a garage, I disconnect the cable and bring it in since the cable itself isn’t designed for wet environments and the charging port can get filled with snow. Something designed for outdoor use would obviously be convenient. The connector that Tesla uses in the Roadster is proprietary, heavy, and difficult to use in the cold. In the U.S., the J1772 connector is becoming the de-facto standard; a conversion to this standard would help me find more higher-powered charging stations, and alleviate the previously-mentioned concerns. While charging from standard plugs has been important for the adoption of the Roadster, getting to standards, more charging stations, and the ability to locate them, will be important for wider EV adoption. While I know I can plug in “anywhere” I am not inclined to spend the time finding these plugs or walking up to restaurant owners to ask if I can plug in, etc. Others have had a lot of success in this area (because the Roadster and electric-vehicle concept is so neat to most people), but I don’t plan ahead of time and often don’t feel like taking the time required to locate a plug. It’s also more difficult in the cold and snow. There are plenty of warning indicators in the dash. Unfortunately, one of them lights up when it’s near freezing outside to warn you of slippery road conditions. I’ve seen this in other cars, too — but it trains your eyes to ignore warning indicators in that area. A permanent place for the outside temperature would be great for this, too; right now it’s only visible on one of the screens in the VDS above the center console — not convenient to look at or get at if you’re on the wrong screen. The VDS (Vehicle Display System) has all sorts of information on it. I find that I usually leave it on the watt-hours-per-mile charge (to see what my current and average efficiency readings are). I sometimes switch to the temperature gauges (which I’ll probably do more frequently when it’s hot out) and the battery level gauge (which contains the outside temperature). It has room for improvement — it’s small, slow, and makes harsh noises — but it’s useful for its target audience. The estimated range is based on the last 40 miles of driving. However, the VDS displays up to only 30 miles of history. The VDS displays temperatures as bar graphs which don’t represent winter temperatures, so I can’t see how close the batteries are to freezing. There are no points of integration with, e.g., an iPhone. Displaying nearby charging stations, iPhone applications, SMS alerts, etc. will be important features for EVs. I hope Tesla stays ahead of the curve here for the Model S (and eventually gets this technology to the Roadster). The gauge lights dim like any other car, but the lights for the transmission control (park/drive/reverse/neutral buttons) don’t dim as well as the rest, and are a little distracting in the dark. The Roadster is the first convertible I’ve owned. I’ve only had the occasion to take the soft top off a handful of times, which is a relatively simple procedure. I’m definitely looking forward to the warmer weather! Driving around with the top off was an excellent experience partly because the wind isn’t particularly intrusive but also because the car is so quiet that you can still hear the birds chirping while driving around the back roads. I don’t have the hard top, and I’ve been through the winter without a garage without an issue. I’d be worried about a lot of heavy snow piling up on it, so if I were away or aware of a large heavy-wet-snow storm, I’d want to make sure to keep the top from taking on too much snow (lest it collapse). The soft top does hold a lot of moisture, so while it’s raining, you’ll need to run the A/C to dehumidify the cabin. I’ve read that this is less of an issue with the hard top. The soft top stores easily in the trunk — although it takes a relatively significant amount of room since trunk is so small. Similarly, the Universal Mobile Charger (UMC) also fits easily but takes a fair amount of space. Getting my computer bag in the back is more challenging when either one is already stored there. I’ve fit a 50 pound bag of cat food and two 40 pound boxes of cat litter and various grocery bags using the trunk and passenger seat. I’ve surprised myself by how much I can get in there. I also know that if I did have a passenger, fitting enough stuff (e.g. for travel) for the both of us would be challenging. The glove box is tiny — but gives me what I need. I have my sunglasses, tire pressure gauge, documents (e.g. registration), gum/mints, napkins, bluetooth headset, toll road transponder, etc. in there. To the user, driving is as easy as it gets. There are a couple differences compared to a traditional car, but you quickly get used to them. The first difference is the push-button “gear” selection. It’s definitely weird (and a fun talking point), but it’s natural. There is a problem with it’s safety mechanism to prevent you from making an unsafe “gear” change that ends up being unsafe. It’s designed to prevent you from switching from drive to reverse (or vice-versa) when your speed is too great. However, when it denies this change, it leaves you in the previously-selected gear. While there’s an audible warning, it takes too long and before you know it, you’re stepping on the accelerator and going the wrong direction. This has happened to me twice now while doing a three-point turn, and in one case, I scraped the underside of the car on a steep driveway entrance because I went forward instead of reverse. This is a very serious safety issue, and I’ve raised it with Tesla engineering. My recommendation would be for it to place the car in neutral if it needs to deny the “gear” shift. As I mentioned before, the regenerative braking engages by easing up on the accelerator. The mapping between how far you’re depressing the accelerator to how much torque the motor provides is hard enough to design. Adding this regenerative component to the mix is even harder — the amount of braking force will depend not only on the accelerator position but your speed as well. Tesla engineering really nailed this design — it’s very natural and I couldn’t be happier with it. It took me maybe 10 minutes to get used to it and once I did, I really enjoyed it. I enjoy driving in traffic now (well, except when I’m late). I don’t usually use cruise control (it’s too fun to use your foot!) — but the two times I have shed light on an issue where if you cancel it (via button or tapping the brakes), full regenerative braking comes on and you slow down a LOT faster than you’d normally intend to. The owner’s manual warns about this, too. In a non-emergency situation, it’s probably best to find where the accelerator position is, hold it, and then cancel it. That said, it’s incredibly accurate. It keeps your speed exactly where you set it, including downhill (since it has access to regenerative braking). The windshield is so short that it’s difficult to see stop lights you’re waiting at. This is sometimes a problem even for me (5’3″). Taller drivers have also mentioned that the rear-view mirror obstructs too much of the forward view — where entire cars can disappear behind it. Taller drivers also have difficulty seeing the dashboard (speedometer and kW meters) because the top of the steering wheel gets in the way. Fortunately I don’t have this problem. Lastly, the car has a number of blind spots. The small rear window (obstructed by the seats) and the design of the rear obstructs rear-left and rear-right views. Adjusting the side rear-view mirrors outwards such that you can only see the side of your Roadster while leaning towards that mirror helps significantly (although takes a bit of getting used to). The interior is a cramped space which causes problems with using interior features. The buttons for the heated seats are difficult to get to and nearly impossible to see their status — especially if you have a passenger on board. The iPod dock (if so-equipped) is similarly difficult to use and places the iPod/iPhone in a position where it’s difficult and dangerous to see or use the screen. Parts of the radio (the Alpine unit as part of the upgraded electronics package) are difficult to see, including the buttons. I also repeatedly hit the wiper when pulling my hand away from volume controls. The steering wheel is comfortable to use — the smaller size works well, the “10 & 2” bumps are comfortable, and the metal spokes provide firm control points. The fact that the horn control is on those spokes reduces my ability to quickly find the horn (and has also caused me to accidentally activate it); I’ve had this design in a previous car of mine, too — and I find it to be a very undesirable design. The headlights are terrible. They’re weak, have fogging problems (even in the newer model Roadsters which have a heated enclosure), and get covered with debris/frost/snow very easily due to the upward-facing enclosure. The rear taillights are bright (“offensively bright” as a friend of mine who’s followed behind me several times has stated). The reverse lights are plenty bright and enable me to see as I back into my driveway. There’s a “dome” light which provides sufficient interior lighting and can be switched on/off/on-with-door like any other vehicle. The interior dash lights are dimmable, from very bright to very dim. Unfortunately, the lights for the push-button “gear” selector don’t dim well and end up being distractingly bright even with the dimmer at its lowest setting. One of the reasons I continue to drive the Roadster even in the New England winter is to prove out how an EV does in the cold and snow. The winter here is far from over and we’ve had temps as low as -10F (-23C) and over 6 feet of snow. Regenerative braking shuts off entirely when the battery pack goes below 40F (4C). It does this because charging the batteries below freezing damages them. Unfortunately, this alters the intrinsic behavior of the car. Suddenly instead of slowing down when you lift off the accelerator, you simply coast. You must quickly re-train yourself to use the brake pedal (and lose out on the range benefits of regenerative braking). Before the car will charge, it will heat the batteries using up to 2 kW of power. This can increase the time to charge (30-60+ minutes, depending on how cold things are). Once charging is complete, the system will keep the batteries above 4C so that regenerative braking will function when you disconnect. On cold nights, I’ve consumed as much as 6.6 kWh of energy keeping the batteries warm (more than half the power to recharge after my 32-mile round-trip commute)! Unfortunately, there’s no way to keep the batteries warm any other way, so if you’re parked somewhere without the ability to plug in, you’ll lose regen (which can take as little as an hour if it’s -15C outside). Here’s an example of the temperatures while it’s -12C outside — pay special attention to the blue line. The power output of the batteries isn’t significantly affected by the cold except for short periods in extreme cold. I’ve observed as much as a 25% drop in top-end power, but by consuming so much power when the internal resistance of the batteries is higher due to the cold, you’ll quickly heat up the batteries and this 25% drop will fade away quickly. Getting into the car and getting under way when it’s -20C is no problem (unlike a normal car where you’re worried if the car will start). It’s almost impossible to notice the impact of the cold on how the car drives. 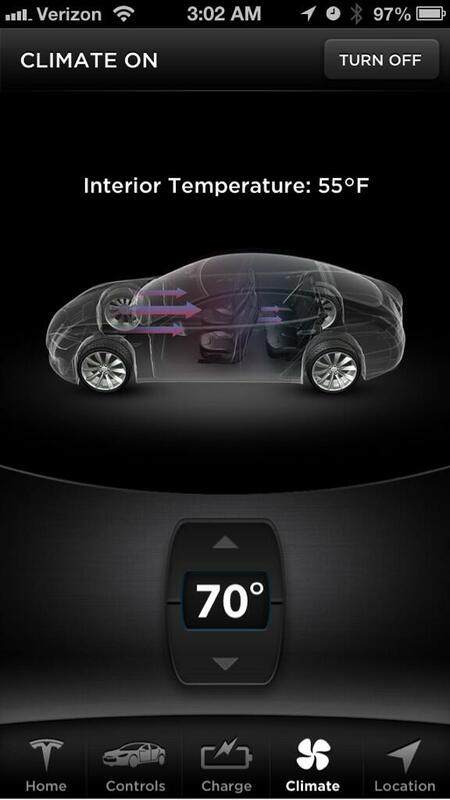 Range will be affected in 3 ways: 1) reduced efficiency, 2) using the cabin heater, and 3) loss of regenerative braking. For short trips in -20C weather, this has affected my estimated range by 37% but it doesn’t matter on short trips (since range isn’t a concern). For longer trips, range will be affected by 10-15%. Cleaning the snow off the car in general is a little difficult due to all the curves. I also pay close attention to the weight of the snow on the soft top (I don’t have the hard top) as I don’t want it to collapse under the weight. A proper outdoor cover (which I’m working on securing) or a garage would obviously help. I only have exposure to the double-din touch screen Alpine head-unit that comes with the upgraded electronics package. About the only good thing I can say about it is that the sound quality (part of which is the speakers) is reasonably good — certainly better than your typical stock radio. Everything else about the radio is terrible. The user interface is clunky, the UI resolution is very low, the features are buggy, the HD Radio functionality provides an extremely poor listening experience if your reception isn’t perfect, and the GPS software is nowhere near as good as Garmin or TomTom. Finding the soft buttons, especially while driving, is very difficult. Worse, there are “pages” of soft buttons, so the soft-button area doesn’t always provide the same functionality. The iPod/iPhone integration doesn’t always work, and the UI for accessing your music and playlists is rather clunky. Music starts playing when you didn’t mean to (e.g. when shifting from Reverse back to Drive because the source is changing from the rear-view camera back to the USB interface). It often sees the iPod but not the phone, so controlling the phone doesn’t always work. I find that my friends can’t hear me on the hands-free when I’m going over 30 MPH — and I can’t adjust the microphone input while on a call. The unit is re-branded for Tesla, and thus any software or map updates must be obtained from Tesla and not Alpine directly. The range of the key fob is terrible — 10 feet at best. I often have to press lock or unlock multiple times because I’m somehow out of range. I’ve have numerous problems with the car — none of which have are specific to EV technology. Some of these are possibly related to me storing and operating a sports car in the winter when it’s not designed to be. The rest I believe to be the result of inadequate experience building a vehicle. I’ve become aware of how much detail needs to go into the design of the car — things you take for granted; curves which affect water ingress, wind ingress and noise, debris collection, damage from debris, lighting, insulation, noise reduction, designing for -30F to +120F temperatures, etc. The post-build QA process also failed to catch a few items. I sincerely want Tesla to succeed (as I believe their EV technology to currently be superior, their ability to act quickly and efficiently, and their vehicles are more attractive to me in many ways than other EVs). As such, I continue to be patient and continue to drive the car in these conditions so Tesla can continue to learn from me. They’re very aware of my problems, have been more than helpful and understanding, and I have no doubt they’re taking this seriously and learning from it. In the 4 months I’ve had the car, I’ve had a service technician visit me twice and the car has visited the NY store twice. 10 items were marked as broken and since repaired. I continue to deal with rattles that I can hear at low speeds over mild bumps, which we haven’t been able to iron out. I’m trying to learn to deal with them, but I would find these noises absolutely unacceptable on the Model S. I’m a little more forgiving with the Roadster because it’s a relatively unrefined (on the inside) sports car. The center console (which houses the “gear shift” buttons) flexes side-to-side when a leg presses up against it or while using it for leverage getting in/out of the car. Friends have noticed it as well. The stock wiper was junk — it skipped across the windshield since day one (meaning the rubber had become inflexible). I replaced it with a Bosch wiper and it’s been so much better. The stock wiper fluid froze solid when the temperatures were slightly below freezing. That’s completely ridiculous (and turned out to be a poor choice to change suppliers somewhere along the way). As for the EV-specific stuff (battery pack, motor, electronics, charging, etc.) — it’s been flawless. That technology feels very solid to me, and combined with a better-quality Model S (due to the employees Tesla has since hired, higher volume, and factory-built process), I’m optimistically hopeful the Model S will be a truly awesome vehicle (which I plan to acquire). Charging is a pretty easy process (albeit a bit hampered by bad or cold weather without a garage). I spend less than a minute plugging it in when I get home, and it’s full the next morning. I spend a few seconds disconnecting before getting in the car in the morning, and off I go. No more visits to the gas station and dealing with the fumes, the cold, getting gas on me or the car, etc. Instead of spending $45 to fill my STi with 93 octane for 220 miles of range, I spend about $10 in electricity (at a relatively high 15 cents per kWh — which I’m sure I could reduce if I switched to a plan that gave me lower overnight rates). I haven’t taken a long enough journey that required me to find a place to charge, primarily because I’m too lazy to spend the time finding such a spot that would work with my plans. Fortunately, that’s not been an issue because, well, I don’t take long journeys. I believe I can call Tesla for assistance in mapping a route if necessary, but haven’t tested that theory out. I also find that the cold weather (my primary experience with the car) keeps me from taking the time to locate something or talking to, e.g., restaurant owners about it. I’ve found that I’m grossly unaware of how far apart things are; can I make it to Cape Cod and back? I get very uncomfortable when my range is below 30 miles because I have no idea how far away I am from my house or a place to charge. I don’t live in the city (I’m about 30 miles from Boston) and my typical destinations take me relatively far; I can’t imagine trying to work that into an EV with an advertised 100 mile range (which would mean 60 mile effective range in the winter) unless I had a second car for anything other than my commute. Part of that is the lack of charging in Massachusetts. All but #2 has been solved (and #3 remains to be tested — needs warmer weather). Even though NY is the closest service station to me (200 miles), I’ve had no problems reaching people on the phone, getting them to show up at my driveway to fix things, or have them show up to pick up the car and take it down to NY for service and return it. Overall, the service experience has gone well. I thoroughly enjoy driving an electric vehicle — and not just because this is a super-fast sports car. The way an EV drives is superior in so many ways that I really don’t ever want to go back. I probably will replace the Roadster with the Model S (more practical in a number of ways) and make it my only car. While I’ve had quite a few problems with the Roadster, I’m confident in EVs, and I have hope for Tesla. The other EVs on the market don’t interest me, and the plug-in hybrids (e.g. upcoming Prius) or extended-range EV’s (e.g. Volt) definitely don’t interest me. The day will come when EVs have 500 or even 1000 miles of range — and I find that really exciting. I’m continuing to work on a draft of what it’s like to own the Tesla Roadster. It’s been nearly 3 months since I acquired it and I’ve been meaning to write this for a long time. The post is suffering from “feature creep” (I keep adding in new stuff to write about), having been busy (AKA lazy), and the fact that it simply takes a long time to put together a post of this size. Since I’ve been silent about the Roadster for so long, I thought I’d give you a preview of my current outline. If there’s anything you don’t see here, let me know and I’ll factor it in (mmm, more feature creep! ).